Choose an option below and SAVE 33%! 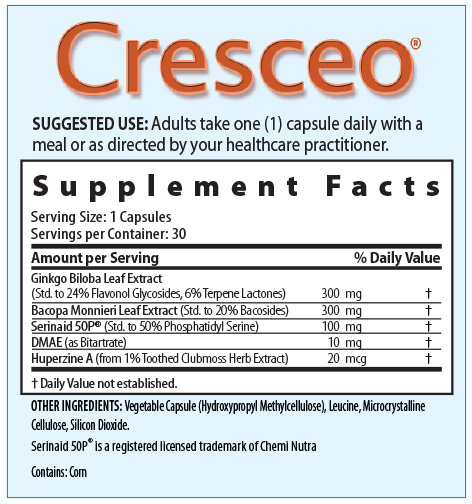 Cresceo™is an all-natural dietary supplement containing Dr. Blaylock's 4 "Brain Boosters" -- essential nutrients that help sustain optimal brain function. All 4 ingredients work synergistically to enhance memory, learning and cognition. Have you ever lost your car keys? And taken a long time to remember where they were? Are you ever unable to find the right word when speaking? Do you forget appointments, names, or other important facts? When you read an article or book, do you have trouble recalling the information the next day? If so, you're not alone . . . Millions of Americans are discovering that as we age, we become concerned about supporting our brain health. An article in The New York Times notes that 10% to 20% of Americans older than 65 are experiencing mild cognitive impairment. Researchers at the University of California report that cognitive decline hits hardest among patients in their 60s and 70s. One in eight older Americans has some loss of brain function. According to Science Daily, 50% of the population experiences compromised mental performance by age 85. More than 15 million adults age 18 or older suffer from age-related or other cognitive impairments. Each year, over one million new cases of adult-onset cognitive impairments are diagnosed in the United States. François de La Rochefoucauld, a 17th century French author, observes: "The defects of the mind, like those of the face, grow worse as we grow old." However, you don't have to be ready for the retirement home to start feeling a bit foggy or lose a step in mental quickness. However, you don't have to be ready for the retirement home to start feeling a bit foggy or lose a step in mental quickness. A study in the British Medical Journal tracked 5,000 men and 2,000 women ages 45 to 70 for 10 years. The shocking finding: Cognitive decline starts as early as age 45. Adults age 45 to 49 experienced a 3.6% drop in mental ability over 10 years. But now a renowned brain expert has discovered a powerful natural way to support cognitive function — and help your brain remain healthy as you age. That brain expert is Dr. Russell Blaylock, a nationally recognized, board-certified M.D. with 26 years of experience in neurosurgery. Recently Dr. Blaylock left a thriving neurosurgery practice to devote his full attention to nutritional studies and research. You can stay mentally alert and reduce memory loss as you age with a combination of daily activities, following a healthy diet and by ingesting certain nutritional extracts to support brain function. But even with a brain-healthy diet and lifestyle, supplementing with key nutrients can be an important step to helping your brain operate at peak efficiency. That's why Dr. Blaylock and his research team have formulated Cresceo™ a daily dietary supplement providing vital nutrients that can help support brain function . . . and that are not present in sufficient quantities in your foods. Cresceo™ gives you 300 mg of ginkgo biloba extract daily. The extract is made from the leaf of the plant, not the seeds. Ginkgo trees are one of the longest living tree species on the planet, and can live as long as a thousand years. Ginkgo promotes healthy brain function in several important ways. For instance, ginkgo helps increase circulation in the brain and supports cells in the hippocampus. Ginkgo extract also helps enhance energy production by brain cell mitochondria, which is essential for memory and for helping protect against excitotoxicity. As we age, a certain enzyme called MAO-B increases in our brain and contributes to age-related cognitive impairment. Ginkgo helps inhibit MAO-B. Although ginkgo biloba has been widely studied, the mechanism by which it supports cognitive function is uncertain. Some researchers believe ginkgo works because it increases blood circulation, while others note that it helps support the synapses in our brain. In a randomized, double-blind, placebo-controlled study published in Phytotherapy Research, 31 volunteers ages 30 to 59 took 120 to 300 mg ginkgo biloba extract for 2 days. The researchers report improvement in working memory, with the best results in 50 to 59-year-olds. Another double-blind, placebo-controlled study, reported in Psychopharmacology, gave one group of test subjects 120 to 360 mg of ginkgo biloba extract, then measured their attention span after six hours compared with a control group that received the placebo. According to the report in Psychopharmacology, the researchers conclude that "acute administration of ginkgo biloba is capable of producing a sustained improvement in attention in healthy young volunteers." In another trial, 395 patients with cognitive decline were treated with either 240 mg of ginkgo biloba or a placebo daily for 22 weeks. Those taking ginkgo showed an improvement on the Short Cognitive Test (SKT), a standardized test for cognition, while those on placebo had their scores decline. Those taking ginkgo showed an improvement on the Short Cognitive Test (SKT), a standardized test for cognition, while those on placebo had their scores decline. Dr. Blaylock's formula gives you 300 mg of brahmi daily — the optimal dosage suggested by research. Brahmi, another plant renowned for its power to keep the mind sharp and the memory strongThe brahmi herb, which is also called Bacopa monnieri, is a hardy perennial ground-covering plant. It grows to six inches in height, with small, oval-shaped leaves that form in pairs along the stems. It has tubular white flowers that bear five petals that have a faint tinge of blue on the outer portion. So, how does brahmi support cognitive health? In a double-blind, placebo-controlled trial, published in Psychopharmacology, subjects taking brahmi had significantly improved speed of visual information processing, learning rate, and memory after three months. The researchers concluded . . . "These findings suggest that brahmi may improve higher order cognitive processes such as learning and memory." In another double-blind, randomized, placebo-controlled study of the effects of brahmi on cognition, 67 adults received between 300 and 450 mg daily of brahmi, the amount depending on patient body weight, for three months. The results showed that brahmi decreased the rate of forgetting newly acquired information. It also improved recall of unrelated word pairs after a short interval. But mainly, brahmi was found to prevent the subjects from forgetting what they had recently learned. Scientific literature suggests PS may help support memory and cognition. Experimental studies indicate that phosphatidylserine may help restore receptors on brain cells. These receptors permit neurotransmitters to communicate with neurons. For instance, a study published in the journal Nutrition found that, for older adults with moderate age-related cognitive impairment, phosphatidylserine has produced consistent modest increases in recall of word lists. In another study, 157 randomized patients got either PS or a placebo for 15 weeks. Verbal immediate recall in the PS group was significantly improved. This result indicates that PS may help improve cognitive performance in non-demented elderly patients with memory complaints. "The results suggest that phosphatidylserine may be a promising candidate for treatment of memory loss later in life." It's a dietary supplement derived from the Chinese club moss Huperzia serrata. Huperzine-A acts as a "cholinesterase inhibitor." It works by improving the levels of neurotransmitters in the brain. Neurotransmitters are chemicals that transmit signals from a neuron to a target cell across a synapse. In addition, huperzine-A promotes proper inflammatory response and is a powerful antioxidant as well. In a double-blind study published in Acta Pharmacologica Sinica, 34 pairs of junior middle school students complaining of memory inadequacy were divided into two groups. One group of students took 50 micrograms daily of huperzine-A for four weeks, while the control group took a placebo. After a month, those taking huperzine-A showed a 10.5% improvement in their "Memory Quotient," a standard measure of memory, versus the control group. In another double-blind, placebo-controlled study also published in Acta Pharmacologica Sinica, 50 patients with diminished brain function took 0.2 mg huperzine-A orally for eight weeks while a control group of 53 patients took a placebo. About 58% of the patients taking HA showed improvements in memory, cognitive, and behavioral functions. In the placebo group, only 36% of the patients improved. Dr. Blaylock is confident in the research behind the ingredients in Cresceo™- and in the processing and packaging that goes into bringing it directly to you, ready to provide you with a source of high quality brain nutrients. "Since starting the Cresceo products I have seen significant improvement with my memory. I am very happy with these products." "When I started taking the supplement I noticed an increase in memory and cognitive functions." "I see results with quicker recall time. But what was most encouraging, I shared a full bottle with a friend whose husband was demonstrating foggy behavior. She told us that her husband now is getting back to normal and that she has ordered Cresceo from you directly for him"